Before you even ask yourself whether the majority of your patients are opting in to the full treatment plan that you give, take a moment to reflect: are you actually providing a full treatment plan? Patients expect that they will receive from your office all the advice they need on their eyecare and eyewear. But are they getting it? Some doctors or their staff members may pull back from providing a full treatment plan for various reasons. It’s important to determine if anyone in the office harbors apprehensions because those people—and it might even be the doctor—could be doing the practice and its patients a disservice. Discussing the what and why behind a full treatment plan is a great topic for a staff meeting. Team members across different practice areas might not be aware of what’s going on in other areas. It could be helpful for them all to hear what the doctor recommends in terms of eyewear, including multiple pairs for specific uses; health and safety issues, such as blue light and UV protection; supplements; diagnostic testing; and additional services, such as vision therapy or specialty contact lenses, or orthokeratology or other custom lenses. As the treatment plan list builds, so does the associated cost. Including a discussion on how to present patient financing options as part of the treatment plan will help staff see that the goal is to help patients to agree to a treatment plan that can help them now and in the future. 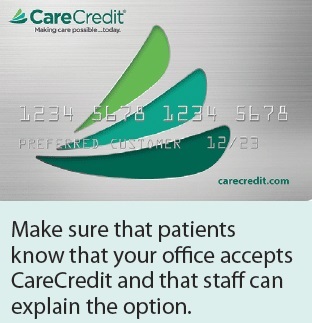 When patients use a financing option, such as by using their CareCredit health-care credit cards, patients may not have to make choices that could compromise their care. Leverage the CareCredit patient financing option with other savings, too. 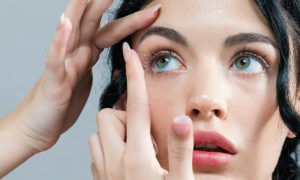 Cardholders could combine special financing with any in-office offers, such as for second pairs or a reduced price on non-prescription sunwear with an annual supply of contact lenses. As a health-care concept, prevention is a strong focus. Patients want to know what they can do now to prevent or delay the onset of serious ocular conditions, such as glaucoma, cataract development and age-related macular degeneration.